Military Mom Prayer Journal available NOW! Every Military Mom has a heartwarming story to share about strength, sadness, and love when their son or daughter joins the Military and especially when deployed. Patti Correa, Published Author and Military Mom is seeking stories from Moms. It’s time to tell the mother’s side. This new book will feature stories from mothers of servicemembers coping with their sons and daughters serving this great country. For more information contact Patti Correa at correahouse@cox.net. 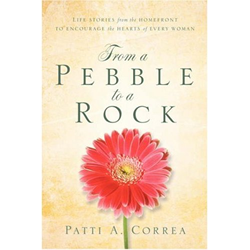 Patti Correa is the author of “From a Pebble to a Rock “, where she compiled stories of military wives, mothers, and daughters from all walks of life. How do they do it? 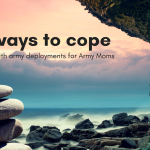 is a question often asked as we see wives, mothers, and daughters of military men go day by day faced with loneliness, more responsibility, and uncertainty that come with separation. Follow Patti as women on the home front tell their true-life, heartwarming stories of love, weakness, and strength during times of separation. These stories of survival will show you the love they have for their husbands, dads, sons, and uncles and their perseverance to keep the families together. What’s Next After Army Basic Training? Note: Some posts on this site may contain affiliate links. If you purchase through any of these links, we will get a small commission which helps to run and maintain this site. Thank you. Be Safe, Love Mom – Order Now!